Homeowners with lawn care service likely don’t notice their yards developing bumpy areas. Those that mow their own lawns, however, are keenly aware of the fact that mowing isn’t as smooth an experience as it used to be. Why do once-smooth lawns get bumpy over time? Several things happen that bring changes to lawns. Trees send out surface roots; moles dig tunnels that result in surface ridges; soil compacts and sinks; and dirt collapses around irrigation pipe leaks. 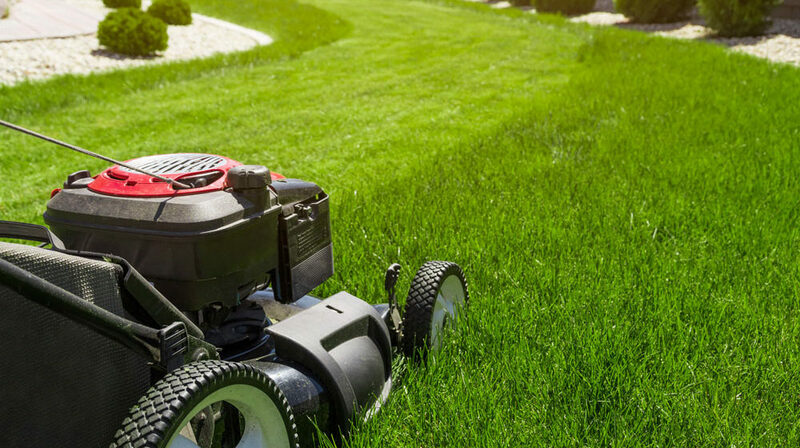 When mowing becomes a teeth-rattling event, it may be time to do some lawn renovation. With work and patience, a bumpy yard can become smooth again. To smooth out bumps, some homeowners will bring in a heavy roller and run it across the lawn to press down high areas. Don’t do this. It compacts the soil and makes it harder for grass to grow in. Step One in smoothing a lawn is to cut it short. This will make it easier to see high and low areas, roots, moles hills, and holes. Step Two in smoothing a lawn is to rake out and remove thatch. If a lawn is large—say, over half an acre—it may be advantageous to rent a dethatching machine from an equipment rental store. Thatch is the layer of dead and organic matter between the soil and the bottom of the blades of grass. Layers of thatch greater than half an inch raise the level of the grass. Step Three in smoothing a lawn is to top-dress the soil. Top-dressing is the practice of sprinkling a layer of soil across the grass which settles in between the blades and raises the soil bed. Top-dressing soil should be a mix of 40% topsoil, 40% sand, and 20% compost. This mix accomplishes two things: the sand raises the soil level, and the topsoil and compost feed the grass. When applying the top-dressing layer, homeowners should take care to keep the depth of the layer between ¼ and ½ an inch. If more than half an inch is put down, it may smother the grass and end up killing it. If in doubt, apply two thin layers several weeks apart. The top-dressing mix can be shoveled on top of the grass and spread with a bow rake. Remember to focus the mix application on low areas of the yard. The ultimate goal is to raise the low areas to the height of the higher areas and thus achieve uniform soil and grass levels throughout the yard. Sometimes holes in the soil have grass growing over them. Carefully lift the mat of grass from the hole, fill the hole with the top-dressing mix, and set the mat on top of the fill. Step Four in smoothing a lawn is to thoroughly water all areas where top-dressing mix has been applied. Areas of the lawn that remain low or sunken require additional top-dressing treatments. Wait until the current layer of the mix is no longer visible before putting on another layer. This will usually take a few weeks. Eventually, low areas will rise to the level of the surrounding lawn.